Encountering a storm in an RV or Trailer can be a very frightening experience. This year alone, Trail and I have found ourselves in the path of a potential tornado and in a forest during a windstorm that was snapping trees all around us. Thankfully, we have emerged unharmed, and the worst our rig has suffered was a broken side mirror. I wanted to try and come up with a concise set of tips for avoiding, preparing for, and weathering storms for RV and Airstream owners. So I give you, the 3-Bs: Be Aware, Be Prepared, Be Safe. When you live or travel in an RV, the weather is something you experience more intimately than in stick and brick home. It is in your best interest to keep tabs on the weather that will be impacting your journey. Climate Prediction Center – Examine drought, rain, and temperature general predictions over a given region in the United States. Data heavy. 2016 Annual & Monthly Tornado Averages – U.S. Tornado compiles data and converts them into “heat-maps” and then breaks it down by state & month. Very handy in deciding what area to avoid given the month. Monthly Weather – Weather channel puts all that weather data into a nice format. If you scroll down you can see averages for temperature and rain over the year. Just be sure to update your location at the top. I use this site to figure out the weather for a future destination. Someone in your party needs to make a habit of keeping track of the weather. Most importantly, you want to have as much warning as possible for storms of all kinds. If you don’t have a favorite weather source, just google “weather” and you should find many good options. There are also numerous good weather apps for your mobile devices. Storm Prediction Center – Information on possible tornados, hail, and wildfire within the next day or so. Google Public Alerts – A real-time map view of weather related public alerts and warnings. Just enter your location and click on the map to view the alert. Know the dangers for your location. Are you in a flood plane? 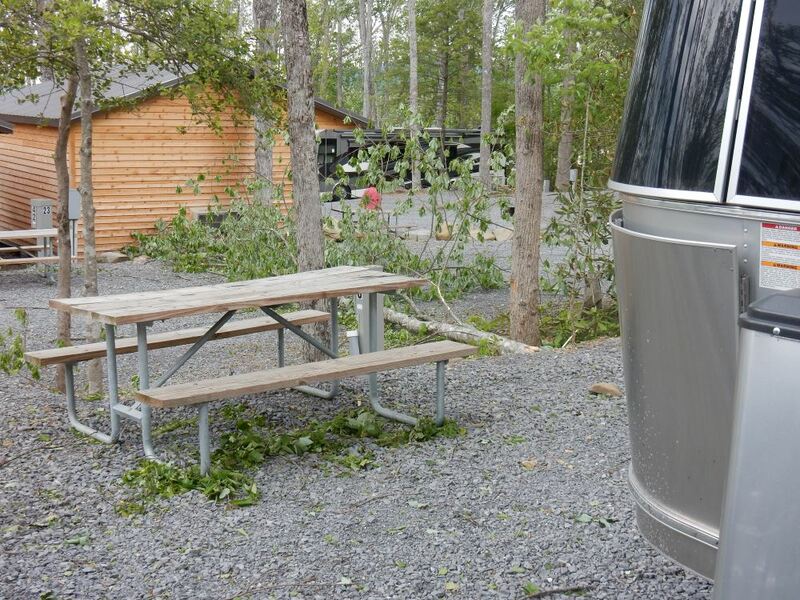 Are there tall trees that could fall on your RV? Is there debris around you that could become dangerous in a high wind? If a storm does threaten you, knowing the possible dangers saves you valuable time in making decisions about what to do. You should also take note of where you can shelter in the event of a serious storm. Find out where the nearest official storm shelter is. Keep an eye out for the sturdiest public building in the immediate vicinity. Stone buildings and buildings with few or no windows are ideal. Often the bathrooms in a park are the safest place to head in a serious storm since they are accessible, sturdy, and have few windows. If there is a storm shelter near by, program its location into your GPS for quick reference. We had trees come down in the lots on both sides of our trailer. You can follow the 3-Bs but “Be Lucky” is also very helpful. Being ready ahead of time is your best step to weathering a storm. Before the winds blow, you are in full control. Take advantage of that fact. Having a portable survival pack is a good idea for any RVer, not just one threatened by a storm. I like to keep mine in a backpack so it is ready to go at a moment’s notice and is easy to carry. A good kit will include first aid supplies, non-perishable food, clean water, and a light source at a minimum. You can buy one like the Ready America 2-person kit, or make your own. The big advantage of making your own is you know exactly what is in there. We keep ours in our truck, in a water proof box. If you know a storm is incoming, I also recommend charging up all your electronic devices. That includes making sure battery powered devices have fresh batteries. The last thing you want is a drained cell phone or dying flashlight during an emergency situation. If you have multiple devices, use them one at a time to get the most life out of them. At the first sign that a storm has a decent chance of impacting you, it is time to get the RV ready. Start by assessing if there is a safer location for your RV to be. If you are parked next to some trees and a big wind is coming, see if you can find an alternate spot that is not as threatened. If you are in a low-lying area in a flood plane, try to find some higher ground you can park on. Don’t try to get out on the road unless you know you can outrun the weather, or get to a known safe location well before the storm hits. An RV on the road during a storm not only puts the RV in great danger, it puts you in much greater danger as well. Driving an RV in strong winds is a terrible idea. Gather up anything not nailed down and put it away. Flying objects are a danger to yourself and others. Turning off the propane is a good idea for a severe storm. Put blinds down to protect yourself from windows shattering. Close up vents and retract awnings. Make sure your trailer is firmly stabilized. Shore power can be disconnected for an electrical storm to help protect the RV systems, but it won’t pose a danger to you. If a storm is coming, you want to get dressed for rough weather. Get your sturdiest shoes on ahead of time and have a coat handy. If things get crazy, you want to be ready to get moving, not struggling to get your shoes on. If you have pets, you want them ready as well. Smaller animals should be in carriers and for larger critters, have a leash at the ready. Including food for your pets in a survival kit is a good idea too. Talk to everyone you are traveling or living with and go over what you plan to do if the storm hits and things get dangerous. You don’t want to be having debates or discussions while the wind is howling and your RV is shaking. Get a plan sorted out ahead of time and get everyone to agree. It isn’t always easy to think clearly when the wind is roaring and trees are flying past. Know what you plan to do, and under what conditions you plan to do it. It’s a good idea to contact someone you know outside the potential storm area and let them know where you are and that you could be in some danger. Set a schedule for checking in with them, that way, if the worst should happen, someone knows where you were and can contact authorities on your behalf. Smaller trees can snap, but big healthy ones can come down like this. Every tree is a potential danger in a big wind. This was right next to our RV Park. Making good decisions during a storm is often the key to survival. You will not always have control of the situation and events may not always go according to plan. These principles should help keep you safe. Once a storm gets going, you need to try and stay calm and think clearly. Follow your plans and follow the directives of emergency authorities whenever possible. Try to act out of logic rather than fear. Take the action that has the least risks and that maximizes your personal safety and those of your loved ones. Remember you are more important than your RV. If you see others panicking, try to help them focus on what they can do to maximize their own safety. Focus on what you can control and try not to worry about what you can’t control. A simple pattern of thought can help deal with these types of situations if you become uncertain. 1. Identify your biggest risk. 2. Consider what you can do to reduce that risk without creating a greater risk. Physically, you want to make sure you are in the safest place available to you. If there is an actual storm shelter, that’s where you want to be. If not, you want to be in the sturdiest building available. Stay away from windows and put as many walls between you and the storm as possible. An RV is not an especially good place to be, but if it is your only shelter, then it is better than nothing. Again, stay away from the windows and in a part of your RV that has the most structure. There is also safety in numbers during a storm. You can help others and they can help you. Weathering it alone is not a good plan if there is an alternative. Keep monitoring the weather and any official sources of information about the storm. Don’t let your guard down until the authorities say that the danger has passed. Once it has, you should look around to see what kind of damage has been done. First, assess your own health and the health of those in your party. Next, check out your RV and see what may have been damaged. Identify any lingering hazards, and work a plan to remove them as best you can in the safest way possible. Also, keep others informed. If you have loved ones who know you were in harm’s way, be sure to let them know you are OK and they needn’t worry further for you. 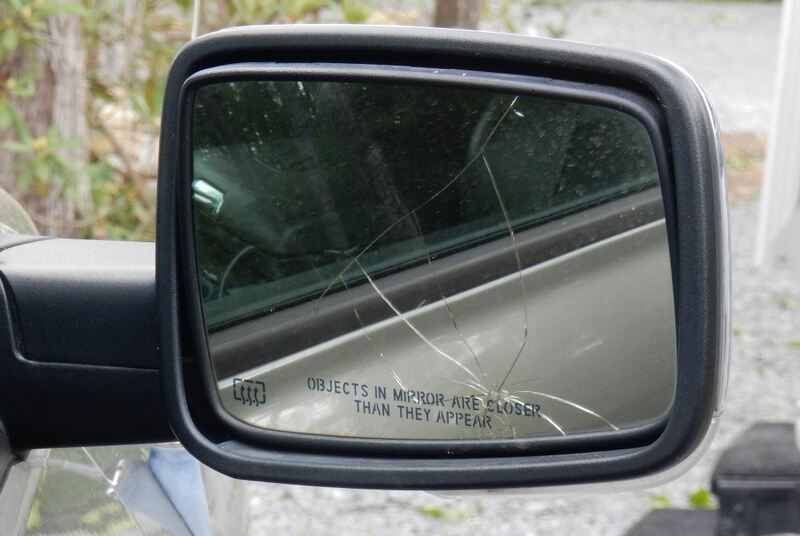 Lucky for us, the only damage we suffered was this broken mirror on our truck. It was hit by a flying branch during the storm. Following my “be” theme, don’t be afraid, be ready. Life on the road has risks, but don’t let them get in the way of living life to the fullest. If you are reading this, then you are already taking the proper steps to being safe on the road whatever may come. Take what wisdom I can offer, and add to it the wisdom of others. The more you learn, the better your chances of staying safe in our wonderous, but sometimes dangerous world.